Her Peaceful Garden: Guest Designer....Scrappin' Great Deals! Congrats on your GTD spot, and what a pretty card you've made to showcase your talent! I love the embossing on the inchies, and all the sequins and flowers are perfect embellishments. I love your Unity FWF tags too - they're gorgeous!! NJ on everything. Thank you so much, Carol!! I appreciate your sweet comment!!! 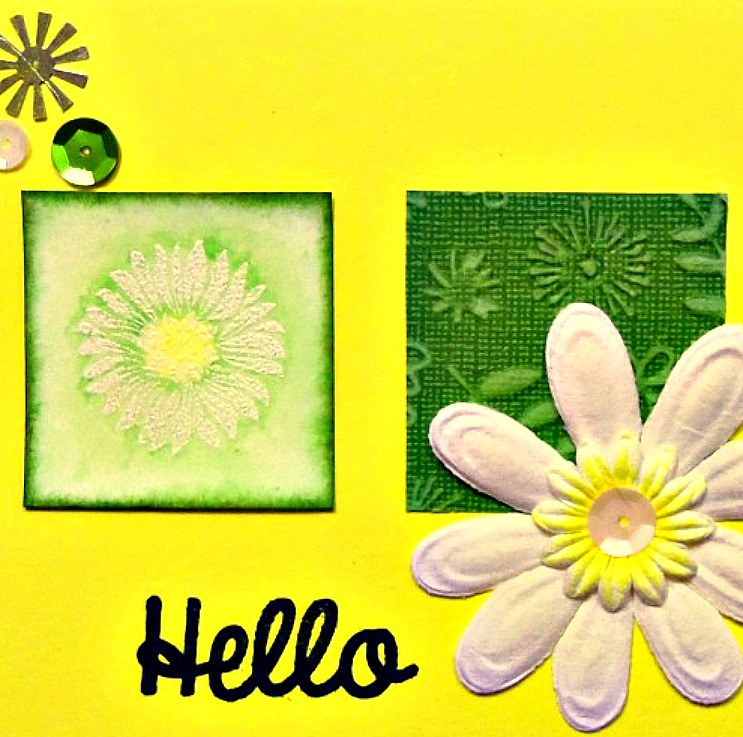 Bright and sunny and I love the combination of dry embossing and stamping on your decorative squares. 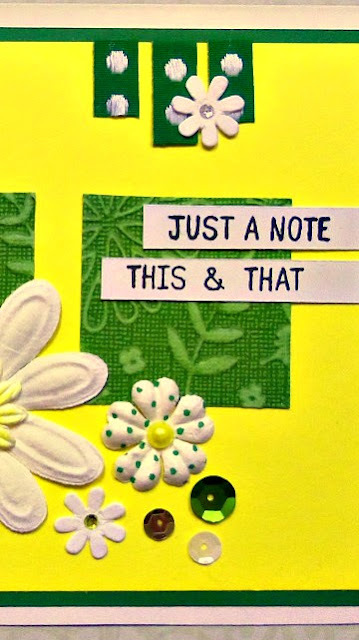 That stamped sunflower/daisy image is really pretty and practically glows! Heat embossing with white and then adding touches of color in the center and around the edges gives an ethereal quality to the flower that is so appealing! 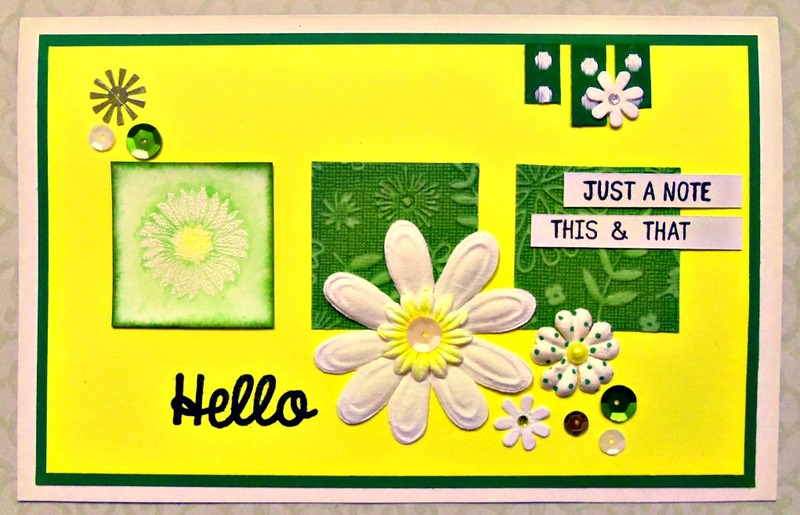 Congrats on your guest designer spot Janis...and thanks for sharing some sunshine! Hey, I just noticed that your sunburst sequin echoes one of the dry embossed flowers! Thank you, Karen!!! I was really needing some sunshine when I was making this.....but now they are saying in the 80s by the weekend. That's hot for May for up here in the mountains of Idaho!!! (I realize I am talking to somebody in CA...lol...so it is okay to think I am a wimp. Hehehehehe...) Thanks for mentioning the square with the daisy/sunflower. :) That was fun to do and I was delighted with how it turned out. Thanks for all your sweet comments!!! Super sweet! Thanks for joining us at the Waffle Flower Challenge! Hi Janis!! I'm soooo sorry I've been missing all of your amazing blog posts!! You are making awesome things! Congratulations on being the guest designer and winning the prize!! You so deserve it!! I hope you are well, and if you want to respond or anything, please email me cuz I know I will get distracted and forget to come back *sigh* I hope to get less crazy soon! love love love love your take on the sketch! Thank you so very much for joining us at Scrappin' Great Deals!!! !